In today’s business, it is important to keep a track on all communication made between client and associates. 16 port USB Voice Logger provides the same facility with its feature of telephone recording system. This device can record all incoming and outgoing calls from all extensions of EPABX in the computer system. It also works without connecting to EPABX when telephone lines are directly connected to it. Not only phone calls but it also gives date-time, talk time, incoming-outgoing numbers, and other information. It records all the calls in a high quality voice which can be accessed anytime from the computer. Duration of calls recorded depends on the memory space used in the computer system. This amazing telecom solution package includes an USB device and software. The software gets installed in the computer system while the telephone lines get connected parallel with device through RJ-11 phone jack. The device also needs to get connected with the computer system through USB port. 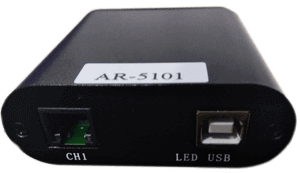 ARIA 5101: 1 PORT Logger gives you access to record the calls of one agent including the incoming and outgoing calls. It has a user friendly interface to fetch the recordings and to monitor the users. 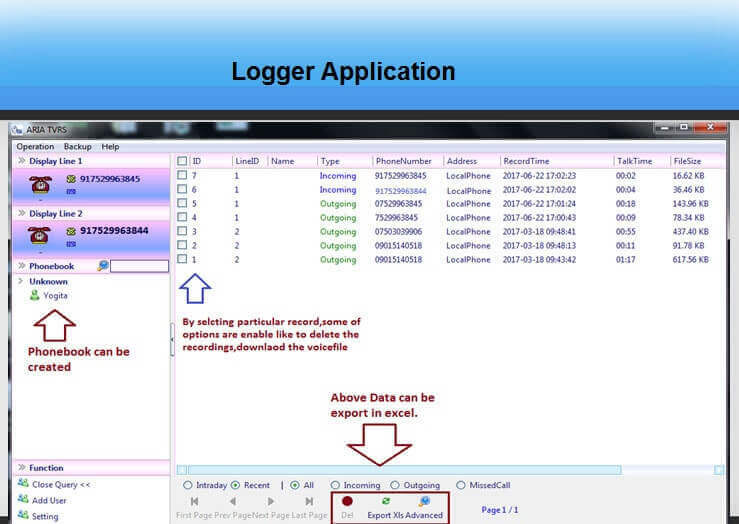 ARIA 5102: 2 PORT Logger gives you access to record the calls of two agents including the incoming and outgoing calls. It has a user friendly interface to fetch the recordings and to monitor the users. ARIA 5104: 4 PORT Logger gives you access to record the calls of four agents including the incoming and outgoing calls. It has a user friendly interface to fetch the recordings and to monitor the users. ARIA 5108: 8 PORT Logger gives you access to record the calls of eight agents including the incoming and outgoing calls. It has a user friendly interface to fetch the recordings and to monitor the users. ARIA 5016: 16 PORT Logger gives you access to record the calls of sixten agents including the incoming and outgoing calls. 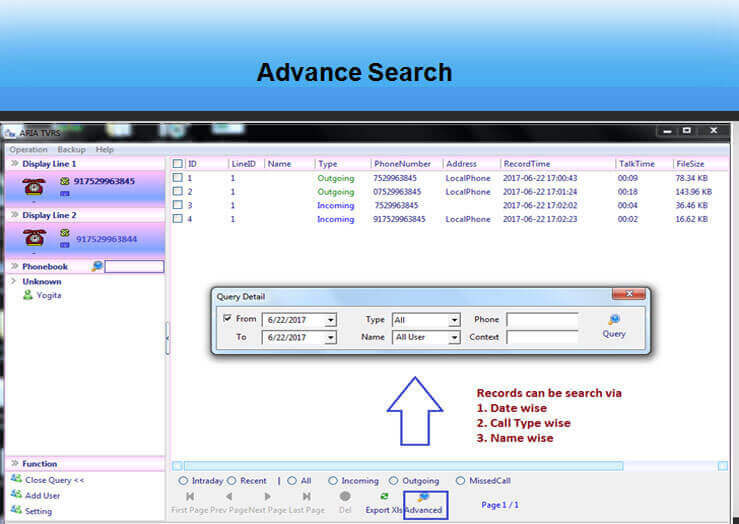 It has a user friendly interface to fetch the recordings and to monitor the users. Q1) How many telephone lines can be recorded with this device? Up to 16 telephone lines can be recorded in a single computer system with this device. The lines will be connected through USB to this device. Te computer system will need to have the software installed to record calls through this device. Q2)	How many calls can be recorded with this device? It depends on the memory space you are having in your computer system. For example, 800000 minutes can be recorded into an 80 GB hard disk. Q3) Can I record my direct trunk lines without having an EPABX system? Yes, you can do so by connecting the trunk lines directly to your telephone recording system. Q4) Can I listen to live calls with this device? Yes, you can do so by using call bargein technology through your computer. Q5)	How can I access or listen the call recordings? You can access the recorded calls anytime from your computer system and listen to them with the help of a headphone. Q6)	Can I record all extensions of my office with my EPABX system? Yes, you can do so by connecting your trunk lines parallel to your telephone recording system. 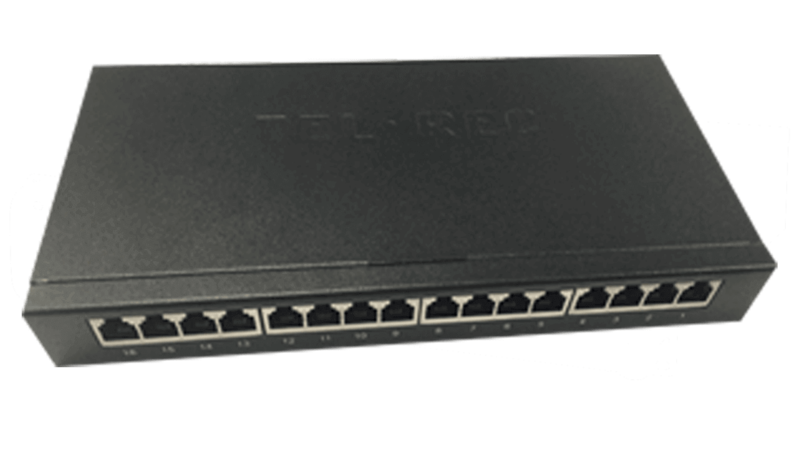 But with 8port voice logger, the number is limited to 8 extensions only. Q7)	Does it also displays missed call information along with incoming/outgoing calls? Yes, it does display missed call information with date, time and caller’s number. It supports DTMF & FSK caller ID format. Q8) Does the caller playlist will display my extension number such as 102, 103 0r 100? For direct trunk lines, it does not displays intercom numbers but shows the own native telephone line numbers. But if you connect selected intercom devices, than it will show their specific extension numbers in the call display list.